How Do You Fix a Watershed? When the deal is done and we’ve protected a new open space, well, that’s when the real work begins. We are committed to caring for our open spaces, in fact, we pride ourselves on being good stewards of the land. It’s some of our most important work. But we can’t do it alone. We rely on the support of partner organizations, groups like the San Mateo Resource Conservation District (RCD) that provide technical assistance to landowners wanting to care for their land. It’s through these partnerships that this work becomes a reality. This fall we partnered with the RCD, with funding from the California Department of Water Resources, to restore a mile of Butano Creek. 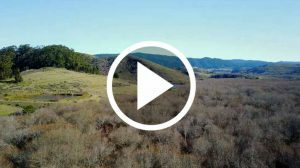 Watch the video and see how we reconnected the creek with 100 acres of its historic floodplain and repaired 10% of the entire watershed! That wasn’t the only time in the past year we’ve relied on the RCD to support our land stewardship. Last March, a massive landslide occurred on POST-protected Cloverdale Coastal Ranches, just a few miles upstream of our restoration site on Butano Creek. Over 8 million pounds of sediment slid into the creek, threatening wildlife and a County road. Find out how, once again, we partnered with the RCD to protect Butano Creek. You see? Partnerships are a key part of our land stewardship, we just couldn’t do it without them!